I've uploaded some drawings to my gallery if anyone would like to see what some of the leaf spring chassis looks like. Keep in mind the frame drawing is still a work in progress and I need to finish/fix it. Very nice! Keep up the good work, and thank you for boosting my dream of trying to accomplish the same thing! Nice work Mark. Do you have a real one someone lent you to dismantle and measure at your leisure? I see the front lower control arm is a little longer than the 427 (10.157") with a shorter space between frame rails obviously that finishes up with a similar track. The wheel widths and offsets were a big factor in muscling out to the 427 body. I have a couple of notes I took from CSX 2276 I'll have to dig up for you. Keep it up! Thank-you for the kind words. I bought a set of drawings from a gentleman a while back. I guess the story is they were taken from an original car back in the seventies. I needed to re-draw them in CAD and figure out a lot of the dimensions. There have been a couple of good friends I have met online who were interested in them and we have shared information, parts sourcing, stories and fabrication help along the way. I could not have gotten this far without them. I am forever grateful for their support and help. I would be very happy to see what notes you have on CSX2276! If anyone is interested in fabricating a leaf spring chassis, I would be more than happy to help. I too would like to compliment you on the fine job with the 289 drawings. What I see in your work is a lot of time and dedication. I also like the fact that you are willing to share your work with us. You are to be commended for your very useful input to this thread. Now for something off the subject: It is too damn hot around here to work! I spent about 15 minutes finishing some welds around the rear tower and I was drenched in sweat. I need air-conditioning in the garage. Rear Control Arm Drawing now posted in my gallery. Mloy---excellent work! You should print up a set of drawings when you are done and retail them....Cobra Restorers seems to do a brisk business at 200 bucks a copy! I'll buy a set ! but how can I get to others' galleries? Your drawings look really nice. 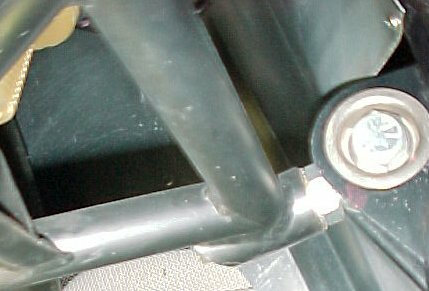 On the control arms for the 289, you may find it helpful to use adjustable heims were the control arms mount to the chassis. There isn't a whole lot of adjustablility on the MkII suspension, at least with the heims you'll be able to make some fine tuning adjustments. While I agree with you 100%, my goal is to re-produce the street 289 Cobra as close as possible with all its faults, idiosyncrasies and within my means. First thing nice looking work. I know nothing about the 289 leaf front end. I was just looking at your picture gallery and landed on DSC 01716 and was wondering how they adjust caster and camber in this setup. I am sure Kris can answer this better than I can but from what I understand, other than shortening the spring or moving the spring left and right (therefore changing the other side as well) there are no adjustments for camber. Caster could be adjusted by moving the spring forwards and backwards but I would think it would be ill advised as the mounting bolt holes would need to be slotted. Last edited by mloy; 07-06-2005 at 09:27 AM..
Ok, thats what I was thinking when looking at the pictures but not being familar with the 289, was not sure if there was something I missed. Thank you for the expl. Caster could be changed by shimming the control arms with washers. On the 7000 Shelby's, all the control arms were mounted in double shear, and the fronts had 3/8" worth of adjustment in them. Camber on an original could only be adjusted by changing the length of the spring. Not real practical, and when the springs settle, the camber changes. The lack of adjustability is why the fliptop and a few comp 289's used the heim jointed control arms. Speaking of settled springs, I need a rear spring badly. Mine has gone from level to concave. The K. bros. spring is reported to be VERY stiff so I don't want to go that way. Since I do not have adjustable arms or top cams, I am reluctant to have a spring shop make one from scratch. Even a very small deviation from spec can render a spring useless. The drawings that are floating around may or may not be totally accurate. I have talked to Cobra Restorers, McCluskey, Motorsports International and Eaton Spring, but got no help. Can the 7/8000 suspension be retrofitted? The rear ride height on these cars is OK, but the front is way off. Because replace the spring is such a pain, I would like to have a new one in hand before tearing the car apart. Also, what does CS use for shocks?